Cast: Vijay Devarakonda, Mehreen, Satyaraj, Nasser, MS Bhaskar, Priyadarsi, Karunakaran and Others. Vijay Devarakonda delivered four memorable films (Yevade Subramaniam, Pelli Choopulu, Arjun Reddy, Geetha Govindam) till date. Can 'NOTA' which is his first political thriller set a new benchmark? Varun (Vijay Devarakonda) is the son of Chief Minister Vasudev. As Vasudev had to be behind the bars in connection with a case, He appoints his Foreign-returned Son as CM inspite of his lack of political awareness. Varun starts taking his job as a CM seriously in a crunch situation. Thereafter, He had to face many challenges. How did Varun overcame them and left a mark of his own as CM forms rest of the tale! Vijay Devarakonda challenged himself by attempting a role which is nowhere close to what he did so far. The intensity shown by him in few scenes is impressive. Especially, He excelled in the press meet sequence. However, Vijay fails to leave an impact as CM after a point due to the manner in which his role was handled. Nobody could understand why Mehreen agreed to be part of 'NOTA' as her role is more like a cameo. The Actress who played Antagonist's Daughter has got more screen time and scope to perform than Mehreen. Sathyaraj and Nasser used their years of experience to excel. MS Bhaskar does a good job. Nothing much to say about Priyadarsi. None of the Songs in 'NOTA' leave an impact but the Background Score by Saam CS is pretty good. The Composer managed to elevate few sequences so well. Camera Work is awesome. Production Values are okay. There is nothing special about the story penned by Shaan Kuruppaswamy. Telugu Audience will find it tough to relate to the subject as it's based on the contemporary Tamil Politics. Director Anand Shankar failed to get the screenplay right. Lack of continuity and consistency when it comes to presentation of scenes is the biggest drawback. Makers hardly bothered to care about the sensibilities of the Telugu Audience. Why did Makers preferred the title 'NOTA'? All those who wait till the very end to know about the justification will be left disappointed. Director Anand Shankar failed to strike a balance between reality and commercial aspects while handling the political subject. Lack of elements which gonna thrill the movie lovers is big letdown. Political Drama is just okay but focus on Tamil Politics mayn't go down well with the Telugus. Although Vijay Devarakonda performed really well in few scenes, The way in which CM Role was designed lacks any speciality. Overall, 'NOTA' ends as an ordinary movie. For any political thriller, Story & Screenplay are utmost important. Sadly, 'NOTA' disappoints in these aspects. Some of the scenes of Accidental CM reminds us of 'Bharat Ane Nenu'. Movie Lovers expected 'NOTA' to be different from other political backdrop subject but it didn't shape up that way. Few scenes look outright silly. Not just the Actors in the movie, Even the viewers question 'What Kind Of CM He Is?' at times. Sequence showing Hero taking his job as CM seriously is worth watching. Vijay Devarakonda leaves a mark of his own in the Interval Block. Even the flood sequence was handled well. However, The same tempo wasn't maintained till the very end. Neither the Director nor the Viewers seems to be having any clarity on how the story has been progressing. Certain scenes in films such as 'Oke Okkadu', 'Leader' and 'Bharat Ane Nenu' offer goosebumps. Attempts were made to create such an impact with 'NOTA' as well but the execution isn't exceptional. Tamil nativity is in abundance in the movie. Flashbacks of Satyaraj and Nasser disturb the flow. Second Half of 'NOTA' is below par to say the least. 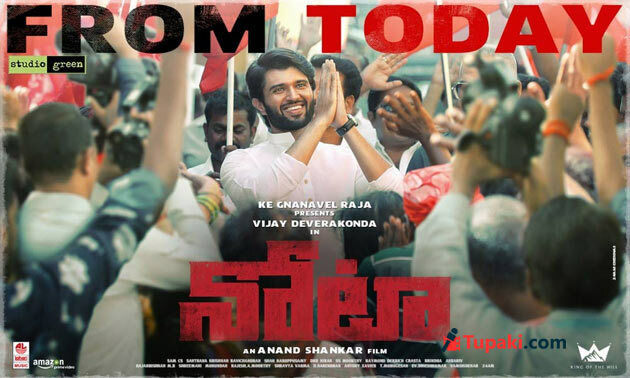 Contrary to his tall claims during pre-release interviews, This political drama is a forgettable film in the career of Vijay Devarakonda. Bottom Line: NOTA....Vote At Your Own Risk!